If you do craft shows, you know show season is upon us and it’s time to dust off the canopy and prepare for the warm months ahead and a busy schedule. There are so many fun things about doing craft shows: getting outdoors, meeting new people, developing relationships with customers and other artists, and making money! Doing craft shows is also very hard work and there’s been lots written on how to assure success at shows. You’ve probably heard a lot of it. Make eye contact, don’t sit all day, encourage people to come into your booth. During these economic times, though, just as we’re having to make adjustments in other areas of our lives, there may need to be a bit of a shift in the way we approach selling our jewelry. Let’s face it, buying jewelry has always been a luxury. But I believe it doesn’t have to be a luxury women forego. Plus, often when people feel the most stressed, buying themselves a small gift is exactly what they want to do. Having a positive attitude is rule number one for selling. Today’s market requires a good range of price points. That doesn’t mean giving away pieces for pennies that took you hours to make. But come up with some new, original designs that take little time with inexpensive materials and make them available next to your more expensive pieces. If you draw a crowd with beautiful designs, priced to sell, chances are your pricier pieces will be hard for some of them to resist! In the brand new Summer Preview issue of Step by Step Wire Jewelry, Connie Fox has written her personal list of sins and virtues for selling at craft fairs. She shares both personal and professional tips for making craft show selling a positive experience and she offers even more suggestions for making purchasing easier for your customers. There are also 13 brand new projects in this issue and an extra free one ("Garnets Galore") on Friday, May 8 on Beading Daily. So use those as inspiration for some new, less expensive designs and get a jump start on a long and successful show season. What tips do you have for selling at craft shows? Share your thoughts on the website. 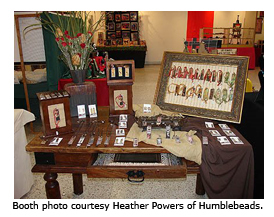 Special thanks to Heather Powers of Humblebeads for sharing the booth photo in today's newsletter. Do You Torture Your Beads?